Some people say the media should only cover what President-elect Donald Trump does, not what he says. But today he let loose another tweet that indicates he hasn’t forgotten his vendetta against the North American Free Trade Agreement, and that has huge implications for automakers—and your choice in what cars you can buy. As Trump’s entire career is built, however, upon an unstable foundation of empty, vaguely threatening bloviation, so are his tweets. NAFTA allows automakers to build cars in Mexico or Canada and bring them into the United States, sans any tariff. Despite this, a lot of cars are still built in the United States due to a whole bunch of solid business reasons. Lately the general exception to this trend is the small car category, because the margins in that business is so thin. Increasingly automakers have been moving small car production to Mexico to focus more profitable truck and SUV production in the U.S., which given current buying trends cements a future for those plants more than small cars ever could. Eliminate the already-tiny margins for small cars and you eliminate those cars. The American car industry is hurt, and the American consumer is hurt. That would really be the only result. Which begs the question of what Trump is talking about, and which we think (think, as this is Donald Trump and sometimes the power to divine what he’s talking about is a bit of a dark art) it pertains to the Chevy Cruze hatchback. The Cruze hatchback is built in GM’s Ramos Arizpe Assembly alongside the Chevy Sonic, another small car. The Chevy Cruze hatchback is actually a relatively tiny seller in the United States, and it’s mostly built for foreign markets. GM just kicks a few of them north of the border because hey, why not, some random oddballs (like us) prefer hatchbacks over sedans. 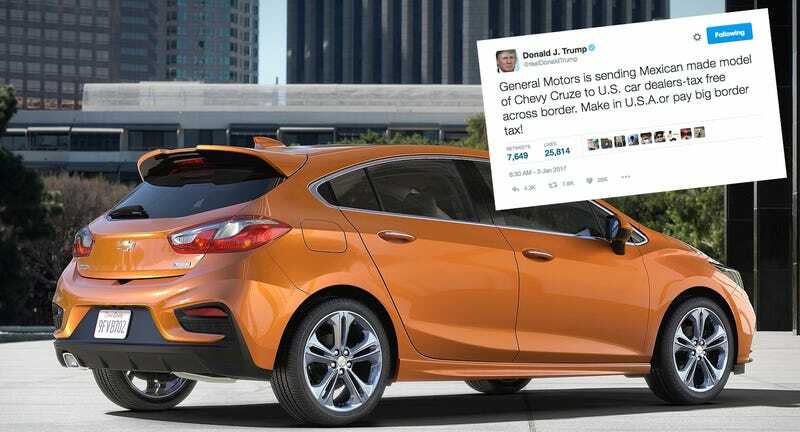 So if President Trump somehow forces through a big tariff on the Cruze hatchback, GM is way more likely to just stop selling it here, rather than try and bring all the tooling for a hatch back to Ohio. It just doesn’t make enough sense for the few people who take advantage of that choice. But we like choice. We like consumers. We like cars. So what the hell is going on? Maybe GM should ask Ford.